NEW Charme Female Guest House (Female Only), Faro, Portugalia : Rezerwuj teraz! We are also less than 15 minutes from Faro International Airport and only 2 minutes from the International Bus Station as well, and the Taxi rank is right outside our door. 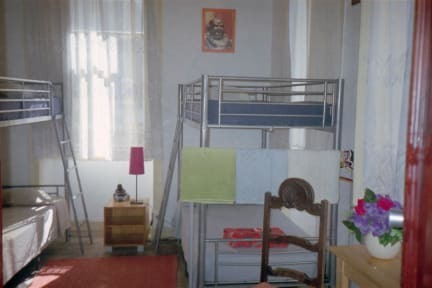 The NEW CHARME FEMALE GUEST HOUSE, has 5 comfortable rooms divided by; One Female Dormitory for Six People and One Female Dorm for Eight, Two Private Double Rooms, One Sixtuple Room therefore for Six People private as well, We also have two shared and fully equipped bathrooms. IMPORTANT NOTE; THE NEW CHARME FEMALE GUEST HOUSE ONLY ACCEPT FEMALE GUESTS WITH BOOKING EXCEPT EXCEPTIONAL CASES. The NEW CHARME FEMALE GUEST HOUSE has a fully equipped reception, Individual Lockers, Living Room, Cable TV in all rooms, Fully Equipped Kitchen, Refrigerator, Microwave, Stove, Washing Machine, and Wi-Fi throughout. the living space, and also an outdoor patio where you can enjoy the Algarve's mild nights, please note that all these facilities are free. IN THE NEW CHARME FEMALE GUEST HOUSE you will find a friendly and helpful staff always ready to help you with any need you may need and also to give you the best indications and information about the entire Algarve region. You can also enjoy the excellent beaches that are on the three islands that surround Faro or any other beach in the enormous stretch of our coast, as we have great transport connections, right here in front of the NEW CHARME FEMALE GUEST HOUSE. Tourist Promotions - As in the Algarve Region, the good weather reigns practically all year round. The NEW CHARME FEMALE GUEST HOUSE promotes a more complete and attractive stay in low season (January to May and October to November), to acquire a special package that includes tours of bike, sea tour through the beautiful three islands that surround Faro included in the Ria Formosa Natural Park or trips to the most important tourist places to visit in the Algarve Region, such as Monuments, Thermal Springs etc ... or just enjoy Scooters, Kayaks or Surf , for a more personal pleasure. For this you will need to send your request by email with the desired dates and the number of guests to apply for, and a special price will be charged that will include your stay at O ​​NEW CHARME FEMALE GUEST HOUSE. Linens, Bed Linen, City Maps, Towels, Free Wi-Fi. Realy nice personnel, guy on reception will tell for you everythink, if he don't know he will get to know, make call and you have ansver, but reception is not 24h and there is no hair dryer as is writen on the website. Room and pots aren't clean. 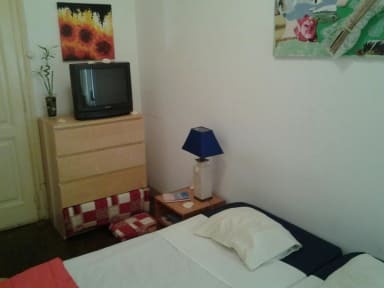 Good hostel for 1 night, next to the train station and bus station, easy to getto the airport. Pretty clean. Very uncomfortable stay. After, we left, The Owner of the Hostel called me by phone and started YELLING at me, accusing me, without any prove, that I literally 'destroyed the bathroom', when I asked, what I destroyed I only received answer: "everything is destroyed" and "dont pretend you dont know, what Iam talking about".He was very aggressive. I was with another person in hostel, I can prove my innocence. Because I destroyed nothing. Cleanless wasn't fine. I definitely not recomend this place.